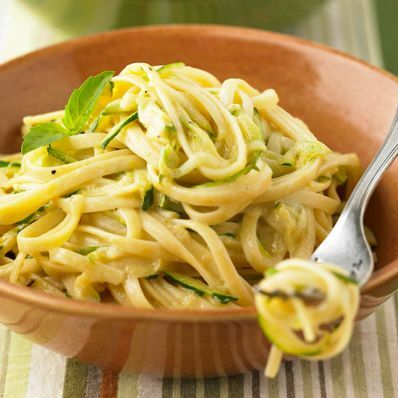 Just a handful of ingredients go into this quick pasta tossit's a great way to take advantage of a bumper crop of zucchini. 1 of 2 Cook pasta following package directions. Drain; keep warm. In large skillet, heat oil over medium-high heat. Add garlic; cook, stirring, about 30 seconds or until lightly browned. 2 of 2 Increase heat to high. Stir in zucchini, salt and pepper. Cook, stirring often, about 3 minutes or until tender. Add cheese and Alfredo sauce; heat through. Transfer to large bowl; toss with pasta. If desired, garnish with basil.